CASE AND POINT: I was studying while the TV was on. They had a program called “Cool Tools.” It captivated me because they were “cool tools.” I am not a spender nor do I buy things on impulse but I felt like I needed every one of those “cool tools.” They even had electronic alarms to guard your “cool tools.” I managed to turn the program off the TV without purchasing any of the tools I was convinced I couldn’t live without. In God’s word he has “cool tools” also that he says we won’t make it without them. 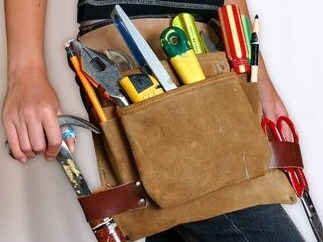 One of God’s “cool tools” is a tool belt. When I go get my hair done, I notice that the girl has all her scissors and combs on a tool belt around her waist. People in construction also wear them so they can have all their tools hanging around their waist and at their DISPOSAL. Tool belts make the carrier more efficient in time and accuracy because they are not distracted with anything else on their mind. Paul says that the believers are to be EQUIPPED with a loin belt of truth, referring to God’s word. CASE AND POINT: A loinbelt was a Roman soldiers most important piece of weaponry. It held his weapons together such as his sword, arrow pouch, and breastplate. If it were not for the loin belt, the Roman soldier would have nothing to hang his essential weaponry on. This gave him the opportunity to move quickly and fight with fury. In your marriage you need truthfulness. The Holy Spirit is the one who REVEALS the word of God that is in you and convicts you to be honest and truthful with your spouse. The word “truth” in the Greek means that which is hidden. This means openness or nothing hidden. Test everything you say and do by comparing it to the plumbline of God’s WORD. As a spouse you must love truth and live truth! What book are you following for your standard?????? For a child of God, your armor is God’s word –the truth. If God’s word is operating in your life, the Holy Spirit will quicken the word in you and use it as a sword. Is God’s word dominating your THINKING for your marriage? You will come apart at the seams if you don’t daily have His Word at the center of your life. Do you have a powerful SWORD to fight against the enemy? Start Loving truth and Living truth today! !